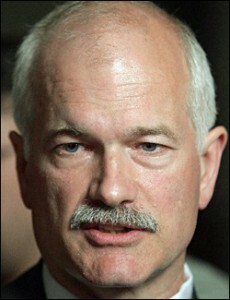 It is so dreadfully sad about Jack Layton dying on cancer. His death seems to have touched most of Canada, He was a much admired politician and human being. He will lie in State in the Rotunda of the Parliament Buildings with a State Funeral in Toronto on Saturday( a unique honour usually reserved for the Head of State, the Governor General and the Leader of the Government, the Prime Minister. He will also will be available in Toronto for two days so people from his city can pay their respects. I suspect there will be large crowds if the informal memorial site across the country are any indicator. This first video is a tour of Jack's riding in Toronto, the Danforth. At one time I owned a home in this interesting riding just south of the Danforth where Greek Town is. When I sold this property I made enough money to purchase my present farm property. This riding is an inner city neighbourhood of older homes and a diverse population, a smaller version of the whole of Toronto. When I first saw this second video I was really impressed. 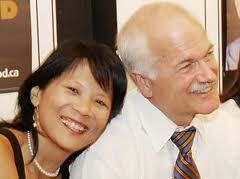 Jack Layton and his wife Olivia Chow live a life that is consistent with their principles. They live in an older house in an inner city neighbourhood, the riding in which Olivia Chow is the member of parliament.. Their house has been retrofitted so that they are virtually energy neutral, even able to feed electricity back into the grid at times. Also, Jack has no car and rides his bicycle around town. He and Olivia occasionally ride a bicycle built for two. This final video is a sample of the political process, on the road, seeking support for the upcoming election. Jack Layton fed off and contributed to the vitality of these occasions. He alway seemed to love to be with people. His political focus was always to have government meet the needs of people, particularly those who were being marginalized by the system. I hope you enjoyed this opportunity to see Jack Layton in life in all his charm, affably with people. He will be missed by all those friends, family, constituents and so many others whose lives he touched. His many contributions to the life of Toronto and Canada will long be remembers. In July, Jack announced that he was taking time off to fight a new cancer. from which he was suffering . He had successfully fought prostate cancer. At that meeting it was obvious he was dreadfully ill but few spoke of it as he said he hoped to be back in September for the opening of parliament. He was no longer the fit vigorous politician who had lead his party to a remarkable electoral victory to take over as the official opposition. He had rebuilt the party from being at risk of losing its party status to official opposition during his tenure. He shall also be remembered, by force of personality and political skill, he convinced large numbers of Quebeckers to give a federal party their support and see Federal Canada as a place to meet the needs and ambitions of French Quebec. 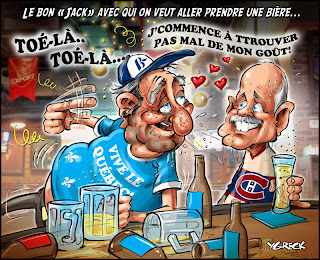 In the process the Bloc Quebecois, the separatist party in parliament was destroyed. Now the NDP, without Jack, will have to lead the progressive opposition to the Conservative government and prove to Quebec that its future can be worked out within Canada. For my American friends, I should say the the New Democratic Party in Canada has no equivalent in the United States. It is a progressive social democratic party. This means that it is a party that seeks to meet the needs and aspirations of people before those of corporations. It's role in Canadian politics has been to keep Canada increasingly meeting the needs of people from a series of programs from the social safety net to universal health care to political and social rights legislation. It is a party that began as a populist party in Western Canada, Cooperative Commonwealth Party (CCF), to finally merge with organized labour in the East to form the present party. Its founder, Tommy Douglas is considered the father of Canada's health care system as well as being considered, the greatest Canadian. The NDP is often called by its detractors as a socialist party. I do not consider it is one. It once was but years ago it gave up on a policy of nationalizing some major industries in Canada and has done little to oppose the privatization of many Canadian industries such as oil and gas, railroads, and airlines. With a Conservative government there will always be pressures to weaken national institutions such as universal health care, the CBC, The National Film Board and other regulatory agencies. There will always be a need for a progressive party in Canada such as the NDP, particularly now. Jack Layton made believers of many that it can be more than the moral conscience of the Nation. It can be the Loyal Opposition and some day it could be the party in power and form the government. This was Jack's ambition. Jack Layton was a populist and was comfortable with all the cultural groups in Canada. He was a man of cosmopolitan multicultural Toronto. (Besides French, he spoke Chinese). 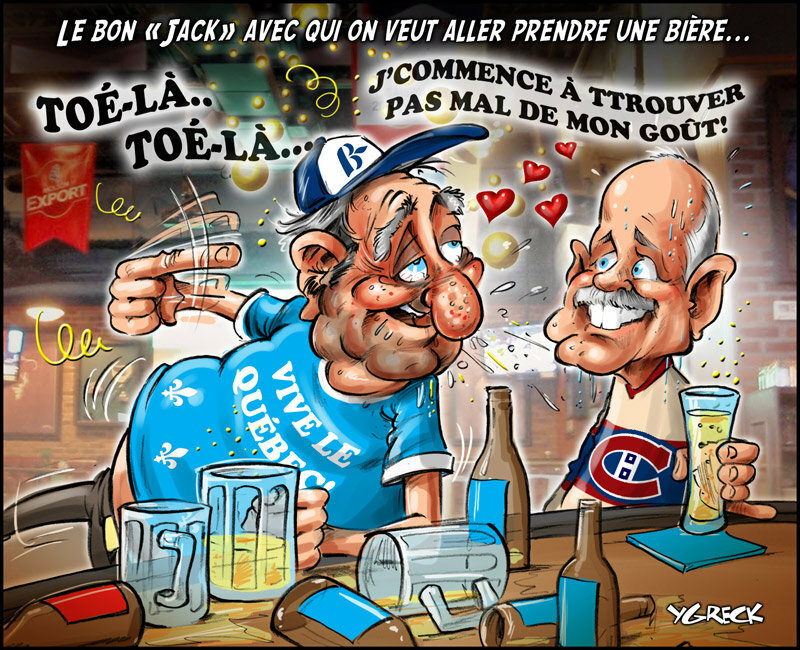 Be was born and raised in an English community in Quebec and knew and enjoyed French Canadian society. His charm, openness and his street level French allowed him to help convince Quebecers to give the New Democratic Party a chance to represent them in Parliament. To honour Jack the NDP will have to work hard to be an effective Loyal Opposition and work for the people of Canada, as individuals and groups. PS: I received from the New Democratic Party this morning of a letter written to all of us his best advice for the future. It is a moving example of the focus and principles of this man who spend his life serving Canada in politics. 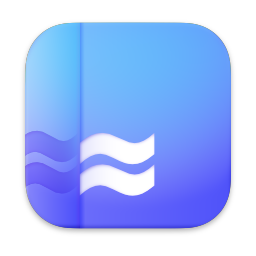 I invite you to read it here. Thanks, Jack. 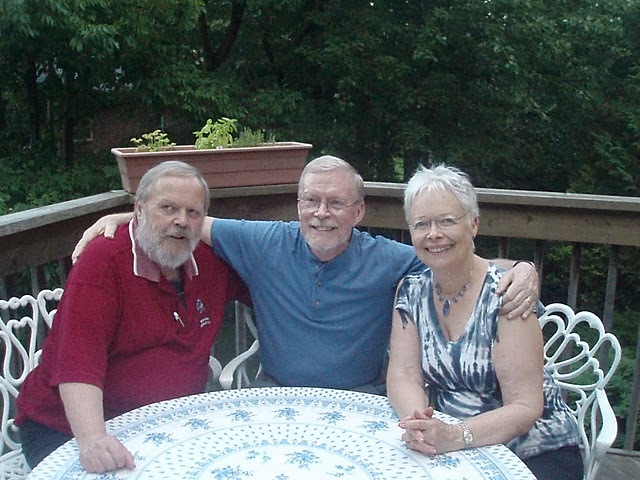 A couple of weeks ago, I had took an opportunity to visit with my brother Richard and his wife Carol. 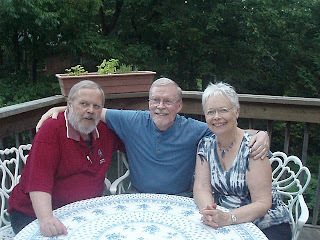 They were on a holiday in Southern Ontario visiting family and friends in both Toronto and Fort Erie. I travelled south with Lynne, who had come North to attend a wedding I was officiating . We went for an afternoon and dinner at my sister Penny's place to share some time with them. 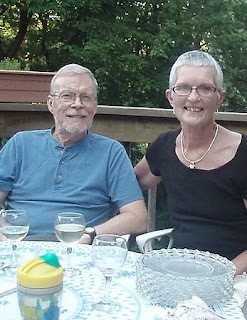 Richard and Carol live in Charlotte, North Carolina, where they are retired nurses. We do not get to see them very often. Those who regularly read my blog remember that Richard and Carol hiked the compete Appalachian Trail last year. Since finishing the Trail Carol has been successfully fighting breast cancer. Being very fit, having lots of family support and successful therapy have all contributed to her successful outcome. It was also Richard and Carol's wedding anniversary. It was good to spend some time with them, celebrating, and get caught up on family information. Richard and Carol will be hiking in Florida soon, doing something they enjoy together. In the future they hope to hike the Pacific CrestTrail from Mexico to Canada. Heidi and her new friend, Jenny. As you can see Heidi thinks she is a lap dog. It seems Heidi worked her affectionate magic and wooed Jenny, who would have liked to have kept her after only four days. I had to reassure her that Heidi and I are "joined at the hip" and I was in no way willing to part with her. 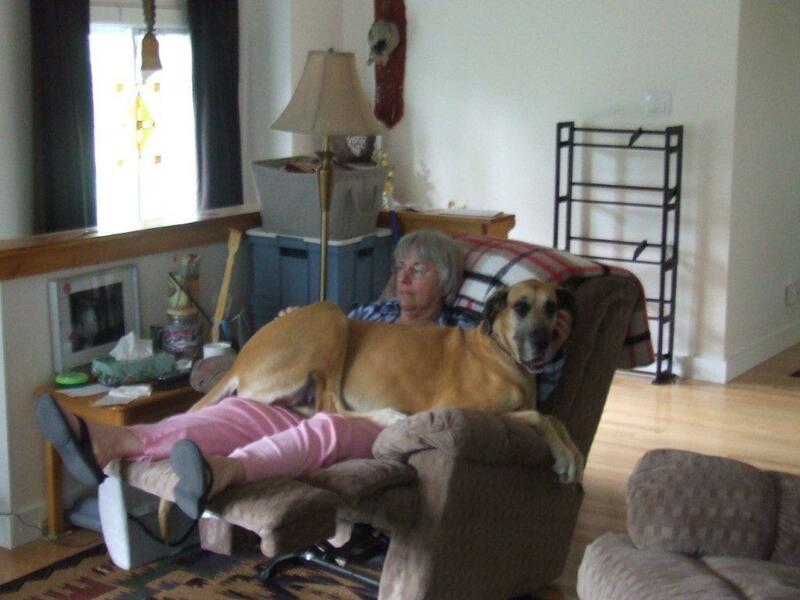 Jenny has offered to dog sit again. Which would be nice for me and Heidi. . . . . and Jenny, I gather. I have three grandchildren, Dylan, Olivia and Travis. They are all excellent students, participants in athletics and lovely young people, a credit to their parents. They all make us very proud often. This past year. Olivia, graduated from elementary school. Ècole publique Jeunesse-Active, in Sturgeon Falls, Ontario. This school is a school in which the language of instruction is in French. Olivia's accomplishment was quite remarkable. 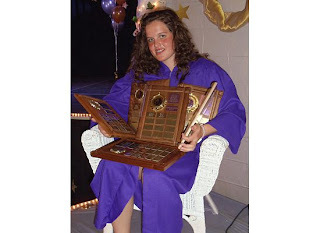 She was the valedictorian of her class. She won numerous awards. She was the top academic student as well as winning the physical education award. She won the history prize and the Français prize. All three of my grandchildren are bilingual as a result of their being educated in a French language school. They have excelled in school . They are one of the few English families to seek out a French language education. Dylan is continuing his education in French at the French public secondary school that shares the building with the English secondary school in which his father works. Olivia will be attending Franco Cité, the French Catholic Secondary School. Of the three children she has come to identify herself as a Francophone the most. It seem knowing the French language is a cultural reality she has adopted. I found out years ago the Government of Ontario considers the ability to speak French as merely a skill. (At the time, I was trying to find out if I was being discriminated against in employment because I was not bilingual.) In Québec, the situation is different. the French language is more than a skill; it is also cultural. To understand this you have to understand Canadian history and politics. Historically, Francophones in Ontario has struggle very hard to keep their language and culture alive. Now they can do so with the blessing of the government and a wider acceptance of bilingualism. I am very proud that my grandchildren have been raised to be bilingual. It is such a wonderful advantage to speak more than one language in our World, and in Canada, being able to speak both official languages allow one to participate fully in the two founding cultures. As a result, of their education they have extended for another generation the French heritage of their mother's family, the Lajeunesse branch of the Renaud family that first settled in this area of Ontario. Congratulations Olivia. I hope and expect you will go on to find success in high school and University if you continue on. You make us all proud. The day the World changed. It was on this day that the Atomic bomb was dropped on Hiroshima. 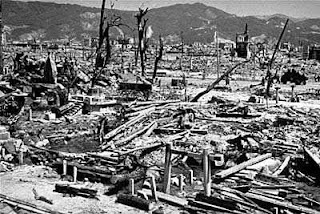 Three days later, once again one was dropped on Nagasaki. It was a day of shame for humanity. We ought to always remember these dreadful events. All my life I have had to live under the threat of nuclear war. Sadly, we still do. It has been 66 years and we still have not rid the World of these weapons. Efforts at doing so are painfully slow. The first protest group I ever joined was the "Ban the Bomb" movement. I believing then what my mother accepted as the truth, that the bombing of these two cities was necessary to end the war. It has taking my own curiosity to do a little research on this to realize that this is a propaganda myth. The bombs were dropped probably more as an experiment than as a necessity. The Japanese were on the verge of surrender with the Russians trying to mediate. The Americans wanted to cut short any influence in the East by the Soviets. There was lots of advice not to use these weapons, include some from the very top ranks of the military in the United States. The argument that "we now have these weapons and therefore should use them" seemed to have won the day. I invite everyone to google some sites that discuss this historical event. Unfortunately, historical research seldom changes the public historical myths, first put forward. At a time when we hear of "banks too big to fail" surely we should consider 'weapons too dreadful to use". The bombs in existence to day are many times more powerful that the "small " ones used on Japan. Such images as this should strike fear in our hearts. Such war on civilians can only be justified when we dehumanize our brother, "the enemy". In this case the heinously cruel Japs. Now the Japanese are our much admired friends and allies. We live with such historical contradictions repeatedly. There is no justification for this. It could be a photo from the liberation of the Nazi death camps? Sadly, we have recently been reminded efforts to still indoctrinate military personel into believing there is some justification in the use of these weapons. The Air Force Academy is now changing an ethics course they have used for decades which tried to convince those who might be in a position to set off a nuclear war that it would be moral and a "Christian" thing to do. As a human being and one who believe religion is an admirable human experience, I am profoundly offended that Christianity, or any religion would be used to justified unspeakable horrors as the use of weapons too horrible to use. If they are, as most seem to agree chemical weapons are, they should be destroyed forthwith. It is this time of year that I think of the Cuban missle crisis and how one Soviet submarine officer, Vasili Arkhapov, prevented a nuclear war. He was one of three officers on the submarine who had to agree to fire in order to launch a nuclear weapon. He refused and managed to convince a second person to refuse. As a result no weapon was fired. If is had been launched, one can be sure the American's would have retaliated. This officer should be better know and revered. According to William McNamara we lived through this crisis without really knowing how close we had come to a nuclear war. 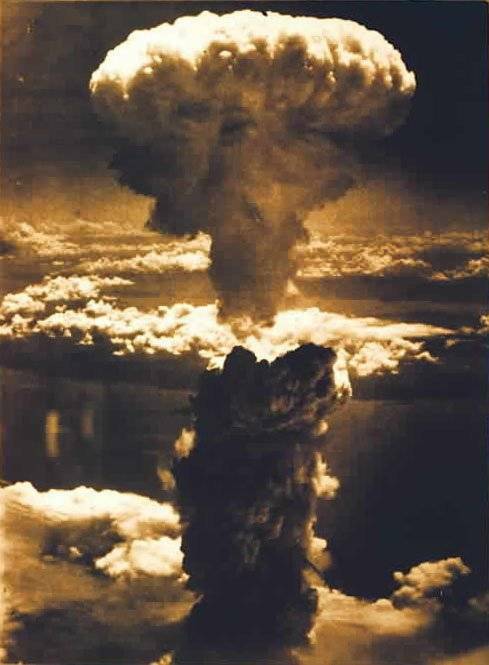 It is past time to make nuclear weapons obsolete. A couple of months ago, I lost my most precious book. I found it this week. I had taken this table top book about Canoe's to my friend Lynn's place to share it with her. I last remember reading on the train ride home on the Northlander. Several days after I got home I looked for it and could not find it. I looked everywhere, more than once. I then began to question myself, "Did I loan it to someone?" "Could someone have come into the house and stolen it". Could my neighbour or my grandchildren or someone else have it? " Did I leave it at Lynne's place?" I did ask some people if I loaned it to them but frankly it was so painful to think about losing it I did not like to mention it to anyone for it might extend into a longer conversation, renewing the pain. I thought I might have left it on the train. But, certainly, I would not not have forgotten to pack it away in my travel bag before I disembarked from the train! It was too important to me to leave it behind. What an idiot I would be to have done that? Finally, I came to believe (tentatively) that I was that idiot. Too much time had passed to contact Ontario Northland Railroad, they only kept lost articles for a month. I was grieving and learning to accept it as gone. Every time I thoutht of it I would feel sorry for myself. Have I mentioned, I am finding I suffer from short term memory loss as I get older? Finally, the other day I was looking for some books to give to my grandson, Travis, which I thought he might enjoy. At the same time, I found myself wistfully looking for my Canoe book. I finally pulled out a book that was put on the shelf back binding down so that only the bottom end of the pages showed. It was tucking in beside the four volumes of the Canadian Encyclopedia. It turned out to be my canoe book. It was a Miracle! Well that is the way I felt. (I am not a big believer in miracles). I had give up at ever seeing it again. And now, there it was. I spent the rest of the day reading it and enjoying the 400 pictures of canoes. It is a treasure of a book for someone like me who loves rivers and canoes. My canoe I have had since I was 17. It is the perfect canoe, a classic. It is a 16 foot, Prospector model Peterborough Canoe, cedar strip canvas covered .It is the same as the canoe that the famous canoeist and promoter of canoeing , Bill Mason, owned. (How is that for an endorsement). It is , in fact, just a coincidence. I remember carefully deciding what canoe to purchase. My choice was the Prospector, a red one, what other colour would a canoe be! I worked half that summer, so many years ago, to earn enough money to pay for it. It cost me $150.00. (Today, such a canoe costs at least that much per foot). The last six weeks that summer I spent alone living on an island on a Muskoka lake, alone and in solitude with my canoe. If only it had gone on longer. If I ever could afford another canoe it would be a birch bark canoe, a great Canadian icon. This canoe is the most wonderful example of native American. technology. I have long been fascinated with this technology that includes the canoe, snow shoes, toboggans, the crooked knife among others. The canoe is close to the perfect artifact. It is just right as the mode of transportation for the millions of lakes and rivers in North America. It is both practical and a work of art. It is light weight and yet capable of carrying a significant load. Most memorable is that a person with a few simple hand tools and build a birch bark canoe from standing tree to vessel on the water and then skillfully propel it through the water. At one time most Native North American men would have known how to construct such a vessel. There are still some native and non-natives who can still create a birch bark canoe. I can only imagine the satisfaction one must feel to build a birch bark canoe and then launch if for the first time in the water as Cesar does at the end of the film. I once thought I would try to build one myself. I only got as far as selecting a tree large enough to get one piece of bark from it for a 12 foot canoe. It was on my neighbours property. When I went to arrange to cut it down I found out they had harvested it for firewood. Oh, No! It is so hard to find a tree big enough as such trees a commercially cut for veneer. This ambition of mine will go unfulfilled like so many other dreams I have had. I have been accused of being a dreamer. I guess I am. which is why I often return to my canoe book and to dream as long as I do not lose it ,or forget, where I left it.